One of the biggest challenges humanity is facing today is to feed the growing population living on our planet, out of which around 800 million do not have sufficient access to food supplies. Water plays a crucial role in the provision of sufficient, safe and nutritious food that meets the dietary requirements for an active and healthy life. 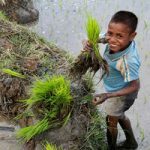 While the connection between water and food security has recently made it to the top of the scientific and public agenda (World Water Day 2012, Stockholm World Water Week 2012 etc. ), the obvious connections between water and land resources for the production of food and the functioning of ecosystems have largely been neglected. This urgently needs to change: we need to manage resources for sustainable development in an integrated manner. Land use and its changes are closely related to water, its availability, quality and management. Recent GWSP research results (Vörösmarty et al. 2010) imply that integrated land and water management are crucial to achieve human water security while preserving ecosystems. The study had shown that vast areas across the globe arrive at acute levels of imposed threat to their freshwater resources. Sources of degradation in many of the most threatened rivers within the developing world bear remarkable similarities to those in industrialised countries.